Dogged Optimism is the story of a scruffy little dog and the woman who loves her. Killarney the Aussie terrier is not afraid of anything: big dogs, snakes, cancer. Belinda Pollard is afraid of many things, so Killarney becomes her in-house motivator through grief, job loss and failed romance. If you’ve ever loved a dog or needed a laugh, you’ll be inspired by Killarney’s motto: Grab life by the throat and shake every last drop of joy out of it. Wrestle it, if you have to. Belinda Pollard is an award-winning mystery author and former journalist who used to chuckle about people who treated their pets like children – until it happened to her. Her hobbies now include dog-walking in the rain and watching dog-training videos. She is a speaker, publishing consultant and book editor. 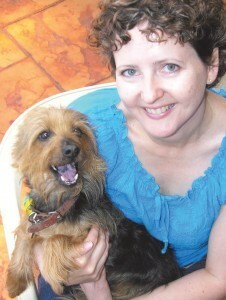 She lives in Australia, travels the world (when she can find a good petsitter), and blogs at belindapollard.com. I confess I approached this book with some misgivings. I am a dog lover, but having a dog as the subject of a book can sometimes render the account over-sentimental and unrealistic for my taste. How wrong I was – Dogged Optimism is an accomplished, inspiring piece of writing that had me completely hooked from the first page to the unexpected and gratifying end. My verdict: it was delightful – not just an affectionate memoir of her much-loved pet dog Killarney, but also an intimate and poignant account of how she grew herself during her dog’s thankfully long life, in career terms, in resilience and in character. 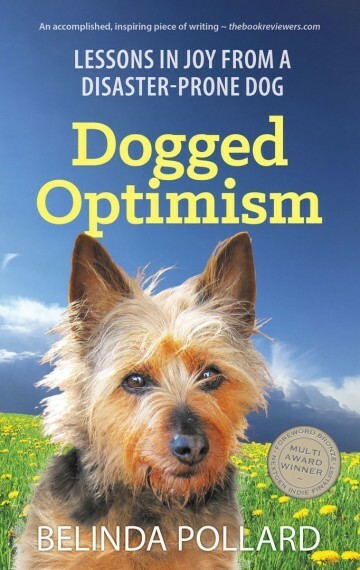 Dogged Optimism is a delightful read, as much about the ups and downs of owning a wilful dog as facing up to life, especially when it doesn’t turn out as expected. Witty and warm, sometimes sad but never sentimental, it is a welcome addition to any bedside table. Anyone who’s ever adored a dog can relate to this evocative, humorous tale of a woman and her beloved Australian terror – er, terrier – and their zany time together. Tissues optional, pet lovers required. Warm and genuine, this journey of a sassy Australian terrier and her spirited Aussie owner will charm you with its window into life Down Under and inspire you with its insights into overcoming personal challenges. A heart-warming tale of one woman’s special bond with her four-legged friend. This book captures the eventful experiences a dog can bring into our life when we invite them into our home. A delightful read.